Is there anything better than ice-cold draft beer from the comfort of your outdoor kitchen or outdoor bar? Which outdoor kegerator is right for you? We've compiled our expert list of the best full-size outdoor kegerators and beer dispensers based on customer reviews, value, style, and performance to help you select the one that is best for all your entertaining needs. Cheers to great beer and friendly gatherings! The Perlick Signature Series 5.2 Cu Ft. Dual Tap Kegerator is our expert pick for the best Outdoor Kegerator. 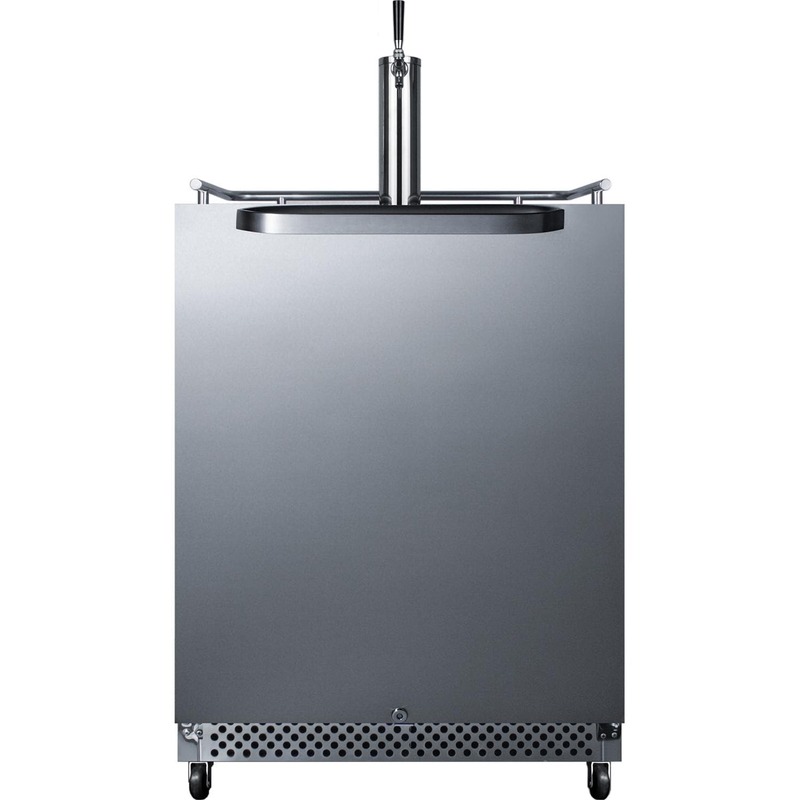 This Perlick Signature Series 24-inch dual tap outdoor rated kegerator is made of stainless steel, and has 5.2 cubic feet of cooled keg storage. Rapidcool forced air refrigeration maintains the temperature to a premium degree from top to bottom. This dual tap kegerator gives you the convenience of serving two different beers at once, and also includes 2 Perlick 650SS flow control faucets, allowing you to fine tune your pour to match the style of beer you are serving. Made in the USA, Perlick makes premium quality products for your outdoor bar. Our next expert pick is the Marvel 24-Inch Dual Tap Kegerator. This dual tap kegerator features a double insulated stainless steel tower that reduces foam on pour and prevents condensation. The Marvel Dual Tap Kegerator also features the dynamic cooling technology which uses fan forced air for faster cooling, faster temperature recovery, and better temperature stability. When not in use as a kegerator, it can be converted into a refrigerator. Two commercial grade stainless steel shelves are included for easy storage. Marvel is Made in the USA, and a leader in the refrigeration industry. The Summit Commercial 24-Inch 6.04 Cu. Ft. Outdoor Rated Single Tap Beer Dispenser / Kegerator is our next pick for best outdoor kegerator. Serve your favorite draft with the Summit Commercial 24-Inch 6.04 Cu. Ft. Outdoor Rated Kegerator. This single tap kegerator from Summit allows you to serve your favorite draft at just the right refreshing temperature. The design of the unit allows for it to be used built-in to your outdoor kitchen or freestanding. This 6.04 cubic foot kegerator features a single tap system, and can accommodate half, quarter, or 1/6 kegs. The front mounted digital thermostat allows you to adjust the internal temperature so that your beer is always perfectly cooled. This unit comes with a complete tap kit including a 5 pound CO2 tank, regulator, draft arm, Sankey American single tap, and connection hardware. Designed to be safely used outdoors. For more expert picks see more of our favorites below. Shop outdoor kegerators for our complete selection.